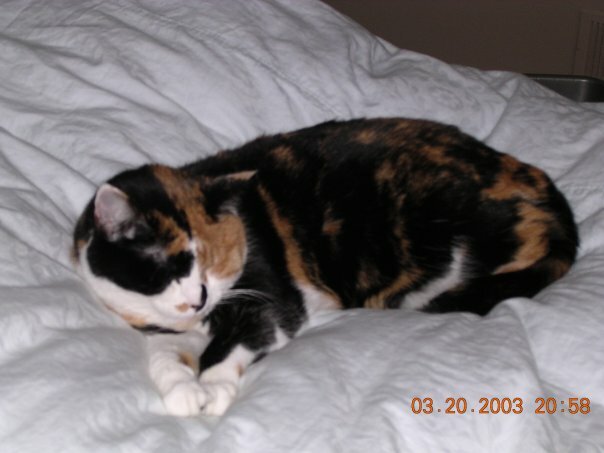 The first true loss of a loved one I experienced was on February 25, 2004 when my precious baby, Princess (though rarely called that as we are big on nicknames in our family), suddenly had to be put to sleep at the young age of seven years old. It was one of the hardest things our family ever had to go through, and to make matters worse, my dad was deployed to the Middle East for four months the very next day. We were absolutely sickened by the loss of our beautiful animal we rescued from the wild in Clarksville, TN. When we took her to the vet on that fateful afternoon, we said our goodbyes to the cat who was struggling for her life. I was out of control crying, petting her for the last time, as the vet and my parents all gathered around her one last time. “In a few minutes, you will close your eyes to sleep, and Jesus will come take you. He will take you home, sweetheart. Do not worry. You will be fine,” I told her, repeatedly. “Say hello to our precious Jasmine,” my mother added. Jasmine was their baby that they had adopted before I was born, who had died of a seizure two days after his 13th birthday in 1999. We were all crying as we watched her be taken to the back room where my parents joined the vet one last time. My sister and I waited in the waiting room, sobbing. I looked at her wide-eyed as that verse stood strong at the top of that page. She told me, “Can you believe that? If it has an earthly body, it also has a spiritual body!” We both smiled through our tears, but still weren’t entirely convinced just by the one verse. Later that day, she told me that she had come across another verse as she began to research God’s view on animals some more. Right before Genesis states that God created humans, it says that he created animals, both in the sea and on land as livestock. God created animals before He created humans on the sixth day, and He looked at those animals and saw it as none other than “good.” He gave them an earthly body, so that they may also have a spiritual body, and He saw their creation as a blessing to the earth. How wonderful to know that our God truly cares for our animals! And not just our domestic animals, but also our whales, lions, and fish! Later on after we had discovered these two Biblical references relating to God’s creation of animals, my mother came to me holding a small book titled something along the lines of, “What Heaven is Like,” with colorful, water-colored painted illustrations and one-liners on each page on what the author believed heaven would be like. It was one of those small gift books available near the register at Barnes and Noble, or perhaps a book you’d consider as a stocking stuffer. Nothing too intense, but also not a child’s book. Just a simple account of what someone’s dreams of heaven. I read the book aloud next to my mother on the couch, crying as we turned each page, struggling through every sentence. Throughout the book, there was one constant illustration, though subtle on each page. It was of a young girl with light brown hair, holding a calico cat. Every page contained this illustration even if the words on that page weren’t conveying anything about animals, there was the little girl in the corner, or in the background, holding her calico cat. I smiled a little as we approached the last page and read the last line (I wish I knew what it was but I can’t remember), and we both looked at the girl with her cat again. “That’s you, Taylor,” my mother said. “And that’s her,” I replied, more tears starting to come down my cheeks. “Wh… wh… when did you buy this?” I struggled to say, realizing what God had revealed to us for a third time. “About six weeks ago,” she said. She never buys little books like that and never really buys books, period, because she’s a big library-goer for her source of reading. I looked at her and said, “That’s it, she’s there, I know she’s there.” God had told me through these two verses and this beautiful book that our Princess was in the hands of our Lord, free from all illness, suffering, and destruction. She was fine, and she would be waiting for me at the gates of heaven when I arrived. And you probably won’t believe me if I told you this, but after we closed that book, I don’t remember us crying anymore about her sudden death. We were comforted with an overwhelming peace that she was in the hands of the One who created her, and that made it all the better. Yes! I’ve heard the Rainbow Bridge many times. It is so true! I just finished reading “Heaven Is for Real” and the little boy that went to heaven for a time and came back said, yes, there were animals there…not just dogs and cats but lions and birds, etc.– and all the animals and people got along fine! And I just don’t see why God would give us these earthly relationships with animals if He was not going to reunite us in heaven. It is just like God to have ALL the most wonderful desires of our heart waiting for us in heaven. So funny that you wrote this post at just the write time. Loved it Taylor!! Yes, I truly feel like He told me to write it for you! At the “right” time, not “write,” haha! I believe that animals go to Heaven because they don’t have a spirit to sense right from wrong (or rather a sinful nature). When animals do something bad, it’s for their natural survival instinct, or what they’ve been taught, but not because they have the ability, like humans with their natural sin nature to know that and accept the salvation of Jesus. Animals just don’t have this ability–it’s what separates us. So either they all are or aren’t going to Heaven, due to this fact. And I believe they are “innocents”, so therefore nothing separates them from God, and they all going to Heaven (pets, wild animals, even insects!). Good point on all of that. That’s all scientific I feel like… but no one can argue that first verse that I quoted! And I hope there’s not insects there, EW! all of God’s creation is so beautiful, it would be ridiculous to believe that animals would be eliminated in Heaven..especially with the amount of joy they provide us here on earth. Animals are a true gift of God. It will be like the Garden of Eden all over again 🙂 I’m excited I get to swim with dolphins still in Heaven! Hehe. And I’m glad we’ll all get to see our pets!